truthfulmind: What Am I Creating? 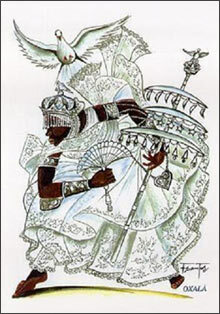 The Yoruban deity Obatalá, whose name means "King of the White Cloth", is also known as Oxalá in Brazil. This self-assessment thing is not easy at all. I am finding my preconceived ideas about many things weren’t true. Specifically, I mean relationships. I have seen only my side for so long, I have much to learn. We are all wounded souls in some shape, form or fashion. It is why we seek a Higher Being, God, Allah, Olodumare and the countless ways humanity sees The Creator of All. We are fragile in so many ways. When we embrace and accept our fragileness, we can see how fragile others are with compassion. Compassion is missing from too many hearts. The first step I have be compassionate with me. I am only human, as the song goes, born to make mistakes. We all are. So why do we want to destroy each other so easily? Why do I allow fear to dictate my responses? What harm do I create when fear is my guide? Did I act based on fear? Or Did I act based on Faith or Knowing or Courage?